The best way to watch TLC's Next Great Baker — or any show, really — is while munching on a cannoli (or five) made by host Buddy Valastro himself. 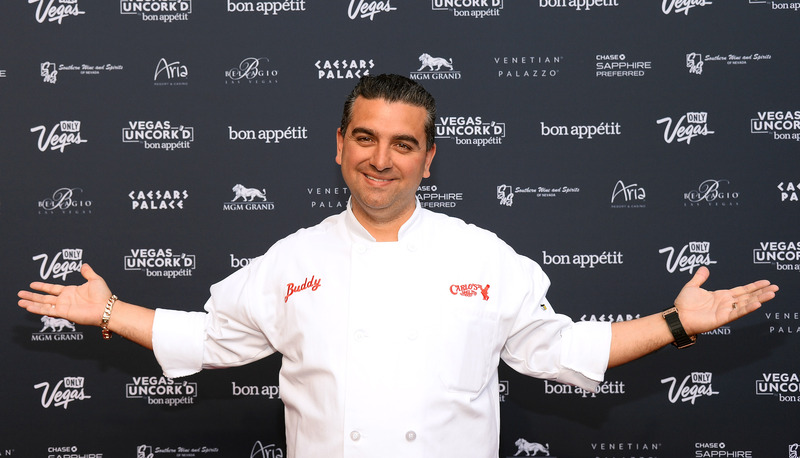 While Buddy, also known as the now-legendary star of Cake Boss, is based in New Jersey, baked goods from his kitchen at Carlo's Bakery can be shipped all over the contiguous U.S. (sorry, Hawaii) as well as purchased at some stores outside of the Garden State. To help you in your quest to enjoy some of Valastro's oh-so-delicious sweets, we have the lowdown on where you can find them — just make sure to buy them in time for Next Great Baker' s second episode, Tuesday at 9 p.m. on TLC. Live in (or near) New Jersey? You've got it made: The state now hosts five different Carlo's Bakery locations so you're guaranteed to be near a bakery full of goodies ranging from tiramisu cakes to dark chocolate mousse anywhere you go. If don't live in New Jersey — or Vegas, the only other place with a Carlo's Bakery — don't worry: You can order a variety of the shop's offerings from its website as long as you live in the lower 48. Sadly, Carlo's Bakery doesn't ship the cakes that made the bakery a household name but does ship cannolis that you assemble yourself so you can pretend you're a Cake Boss for a day, along with flavored pound cakes, rugelach, and more. For cupcakes and birthday-sized cakes, you'll have to visit the actual store — for easy pick-ups though, just place your order from the website and pick your goodies up at an assigned time from the store. Carlo's Bakery, a place that finally understands our urgent need for cupcakes. Once upon a time, there was a show about Buddy and his family called Cake Boss and the success of the show led to a lot of great things for that family (and for our stomachs, obviously), including its very own cafe in Times Square. If you've ever needed a reason to visit Times Square, this is it. The Cake Boss Cafe sells all types of pastries including New York's classic black and white cookies and the confusingly named lobster tails (they're actually flaky pastries filled with cream, no shellfish involved) — and yes, there are cakes. Need a patriotic cake to impress friends at your Fourth of July barbecue or a cupcake to cheer up your co-worker? The Cake Boss Cafe is your place. The shop, which opened just over a year ago, also sells Cake Boss-brand coffee so you can sip on their special dulce de leche-flavored coffee while noshing on a fresh croissant for the full Cake Boss experience. You can find it at 625 8th Ave., New York, NY.